Thought ginger ale was good for you? Then you out to try ginger water served hot with ginger tea you get all the benefits of hot water and much more. Ginger tea has health benefits rooted in the benefits of hot water. Just by simply adding a few slices of ginger root to your cup of boiled water you can increase your core temperature turning the heating power of ginger loose in your body helping you bring out the best in your diet. What are the benefits of drinking hot water with ginger root? Plain hot water is a drink good not only for when you are on a diet but also in health maintenance and for cosmetics purposes. Only by changing the temperature of the water you drinkit is possible to drastically change the effect water has on your body. Some people might be "drink cold water in one gulp", they can reduce the diet effect of cold water. The "ginger + plain hot water" which added ginger to the charm of plain hot water or plain hot water is explained. In today's Slism, we will discuss how easy it is to get the great benefits of ginger combined with hot water in your diet to raise you core temperature giving your metabolism the boost you need for healthy sure weight-loss. Japanese have a word for it! That is Sayuthe hot water that use drank throughout Japan for it considerable benefit in terms of health. Sayu hot-water is referred also what is called Yuzamashi in Japanese, lukewarm water cooled from boiling to about 104 to 120 degrees Fahrenheit, a decent temperature for drinking anything below hot. There is a very gentle and soft image that Sayu hot water has on the body. Hot water Yuzamashi is often given to babies and to people when they are sick, which says something about the purity of Sayu hot water. The English contemporary to Sayu hot water is distilled water. In finding the right temperature to drink your hot water at you may be thinking that hotter water is better at warming your body. Drinking hot water is good stimulating the throat, esophagus, and stomach; however if the temperature is too high, there are potential side effects that you have to watch out for. A temperature somewhat higher than body temperature is effective (at a temperature lower than body temperature, let's keep in mind that it cools the body). Since it is distilled, chlorine and other chemicals are vaporizable. Internal organs can be warmed and the whole body gets warm. The temperature of the environment surrounding your internal organs is called deep body temperature in Japanese, which in English refers to your core temperature. It is easy to be subject to the influence of food, a drink, etc. which could not be subject to the influence of the external world easily, and took in it compared with the skin temperature which is the temperature of the bodily surface. 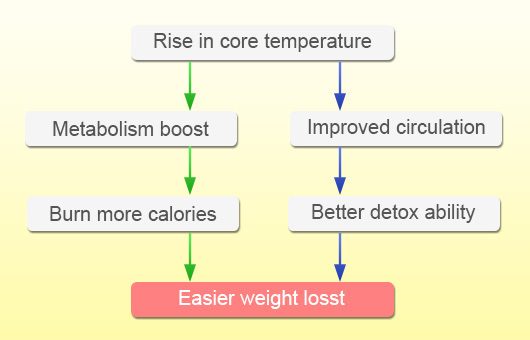 Although think that it is hard to feel this core temperature in a usual life, in fact, metabolism is influenced greatly. If your core temperature increases so does your metabolism, and it can make the constitution in which are easy to become thin and it is hard to grow fat. Furthermore, if deep body temperature becomes high, since blood circulation will be promoted, discharge of wastes increases, and the effect etc. which make the dropsy dissolution effect and the constitution in which it is easy to become thin are acquired. 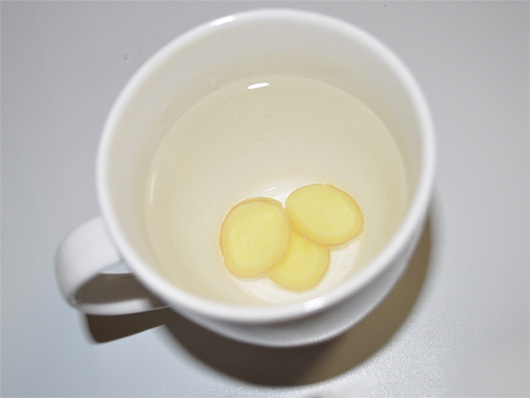 Plain-hot ginger water in diet help raise core temperature and various effects are acquired. Furthermore, how about adding the ginger which attracts attention as food with the effect which warms the body!? Ginger tea and ginger root tea also added the ginger of familiarity to plain hot water! Like a photograph, the slice of ginger is added to plain hot water. There are few pungent condiments of ginger and it is easy to drink them rather than using the grated ginger. Although drunk slowly, the belly becomes very poka-poka warm. And the body gets very warm as well. It has realized that the body gets warm only by drinking one cup. It is recommended at a person oversensitive to cold. Ginger Is Convenient When Frozen Away! 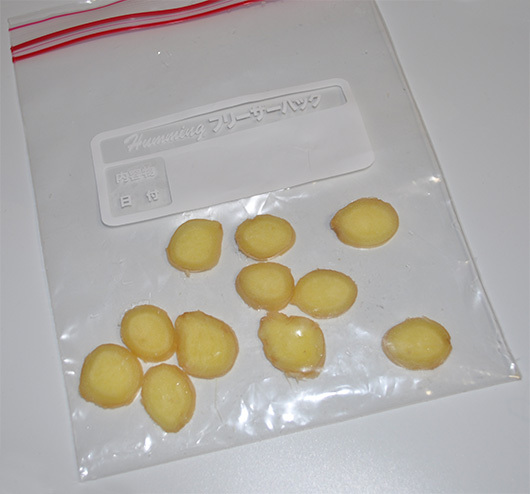 It is good to use the ginger of a tube, and the person that it is serious preparing ginger each time also has a method of preserving the sliced ginger in frozen storage. It can be used for simmered dishes etc. it not only can add to a drink, but, and is convenient! It is the point which it freezes as ginger does not overlap although the sliced ginger is put into a preservation bag etc. and is only frozen. Ginger slices when it frozen, if it keeps in piles, it will solidify abreast. How Does Ginger Root Tea Compared To Ginger Black-Tea? Although the ginger tea diet became the center of attention, which is good by putting ginger into plain hot water, and putting ginger into tea. Probably, the diet effect of ginger tea will also be good to take in the direction suitable for oneself in consideration of the merit demerit of ginger tea, etc., since the portion by the effect of ginger is large. It is also good to combine ginger plain hot water and ginger tea. Ginger plain hot water with a person gentle to the stomach with the case where it drinks first thing in the morning, or the weak stomach and intestines is recommended. If it drinks while temperature has been high, compared with plain hot water, a burden on stomach, an esophagus, etc. The pigment contained in tea causes dental coloring dirt (in order to prevent dental coloring dirt, cared briskly.). Since caffeine is included, it must be cautious of superfluous ingestion during pregnancy and breast-feeding. Ingredients, such as Zingerone and Shogaol, are contained in ginger. There are an effect which promotes the working of the stomach and intestines, and an effect which improves blood circulation of evasion in these ingredients. By adding ginger to plain hot water, effects, such as increase metabolism, blood circulation promotion, etc. of plain hot water, are heightened, and the diet effect is heightened. Let's face it. You may be looking for other ways to spice up your diet movement other than ginger tea that involves drinking water. If you liked the ginger tea diet, then adding the water diet for a natural cleanse to the many ways you can lose weight keep it off may be something you might have a hard time refusing. On the water diet, all you have to do is make sure to drink at least 2 liters of water a day. How you do it, doesn't matter. The rest is left to come when you naturally detox your body, alleviate constipation related issues, and prevent overeating all just by drinking water. 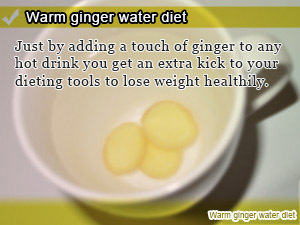 Just by adding a touch of ginger to any hot drink you get an extra kick to your dieting tools to lose weight healthily. The synergy between hot water and ginger creates an explosion that erupts by bringing up your core temperature and your metabolism. 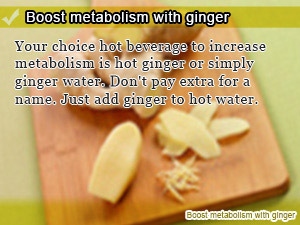 Your choice hot beverage to increase metabolism is hot ginger or simply ginger water. Don't pay extra for a name. Just add ginger to hot water.